Jaks Artifacts is now standing at stud in Maryland at Select Breeder's Services for his new owner. He is the sire of World Champions, Congress top five, Futurity Champions, Circuit Champions, etc. We have kept all of his sisters for our breeding program. We will continue to offer training, showing and lessons as well as horses for purchase. uiet, intelligent, kind and trainable describe the disposition of Jaks Artifacts.Handsome, well balanced, elegant, strong and short backed, with solidly built hooves and bone describe his conformation. Long, low strides with plenty of suspension describe his trot. He rocks back with tremendous impulsion in his hock when he canters. He is light on his feet with proper cadence and rhythm. His dam, Jaks, was imported to the United States from New Zealand as a show hunter. We purchased her when she was 9 years old and still showing. 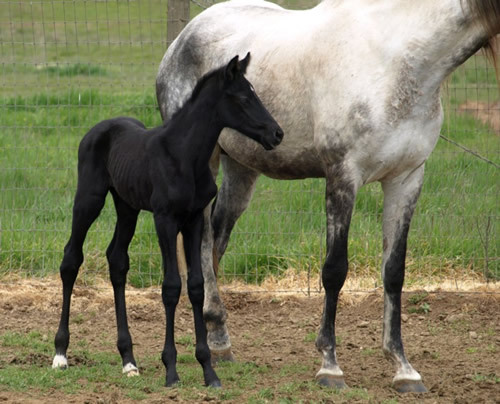 Jaks is a 17.1 + hand dark brown Thoroughbred with a long neck, short back, very correct conformation, great bone and solid well balanced hooves. She has that daisy cutter stride. At the trot, she has the float we all want and she has the nicest rocked back canter we have ever seen in a Thoroughbred. She was 100% sound, including clean x-rays, when we purchased her and she still is today. Captain Jason, the sire of Jaks, was a dark brown 17+ hand New Zealand Thoroughbred that sired successful hunters and distance runners. 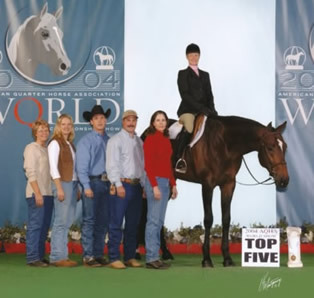 Jaks Artifacts’ sire, Indian Artifacts, is a 17.2 hand dark brown AQHA Hunter under saddle World Champion and a Congress Champion and World Champion sire. His sire is the famous Artful Move who is a World Champion, World Champion sire and leading sire of English horses. This photo, taken June of his 2-yr-old year, demonstrates his natural way of going. 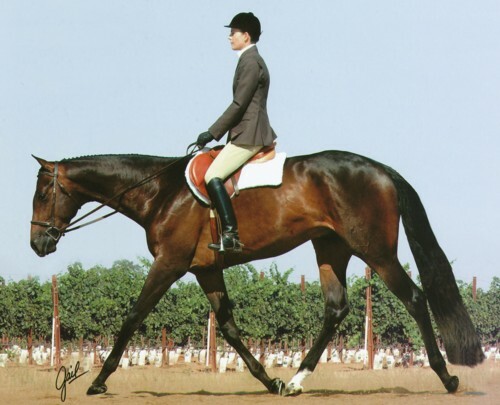 His trot stride, head and neck carriage typifies the AQHA standard as written in the official AQHA rule book. Trot stride reaches perfectly from behind into the footstep of the front hoof Perfect, long even stride with the front and hind stride exactly the same. 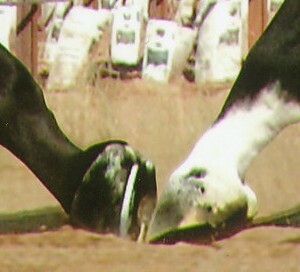 Naturally level topline.